A new Miss USA has been crowned and she’s such a good pick, congratulations Deshauna Barber a.k.a Miss D.C. USA!!! On June 5th, the world went wild as one of the most famous pageants took place in Las Vegas. As I have previously shared, the preliminaries had taken place on June 1st and, when combined with the separate interview score with the Judges, the top 15 finalists were selected out of 52 girls and announced live. Once the 15 girls were selected, a guy’s favorite section happened: the swimsuit portion where the girls get to strut across stage showing their hard-earned and amazing figures. After the voting, the number then dropped to 10 as the girls advanced to the evening wear portion, which is often a girl’s favorite section. This is when the finalists were judged on their grace, confidence, and poise rather than their dress. After the elegant walks took place, the top 10 quickly became the top 5 where the most nerve-wracking part of the competition took place: the onstage question. Becoming Miss USA is more than beauty. It’s about confidence and intelligence as well. The titleholder must be eloquent while answering questions. She is expected to be well spoken when dealing with various interviews and lobbying in Washington D.C. to elective officials. This year’s question was set up differently than the past Miss USA pageants where a random question was selected from a glass bowl. The 2016 way of doing it was “randomly” selecting the order of girls and a judge posing an assigned question to each one. It comes off rather suspicious that we cannot prove the questions were random. For example, a military lieutenant was asked a question about women in the military. Many believe this to be suspicious but, regardless, Miss D.C. USA did a phenomenal job answering the question. The other contestants did decent job answering but it was clear that Miss California USA’s answer was the weakest as she took longer to answer, had to take a breath for composure, and answer again. While it is completely appropriate to pause as you think, it was evident that she struggled with the question and she let her nerves show. No matter how much the girls prepare to answer questions, ultimately they may be asked about unfamiliar topics and when put on stage in front of thousands live and millions at home, it’s very easy to let pressure take over. However, if the one of the world’s greatest athletes dies two nights before, it may be good to research his legacy. This could have strengthened Miss Alabama USA’s answer greatly. The top 3 candidates from that round advance to the final round where they all answer the same question before one is crowned. This year’s final question asked the contestants to describe “Confidently Beautiful”, the Miss Universe Organization’s motto. Miss Hawaii USA answered first and it was good albeit short and bland. Next was Miss Georgia USA and her answer was longer and more eloquent. Lastly, Miss D.C. USA answered and she gave yet another phenomenal answer while using her army background to strengthen it. It was no surprise that Miss D.C. USA was announced the winner as she frantically and anxiously held the hand of her competitor and first runner-up, Miss Hawaii USA. While many candidates performed well tonight, Miss D.C. USA walked and carried herself like a true queen as if she had already won the crown. She had a regal composure to her, carrying her head high, showing no signs of insecurity. She had a spark in her eye that spoke of the belief she had in herself. Two hours before competing on stage, she captioned a picture stating how proud she was to represent military service women around the world and break the stereotypes for both them and pageant girls. She took a humble approach saying, “no matter what happens…”. That’s another beautiful quality she possesses: a humble and grateful attitude. She understood that there were 51 other women who could take the crown but she still believed in her own abilities. She’s in fact a friend of my friend’s, who happened to be the judge on the Miss D.C. panel selecting her as a winner. The day she arrived to Las Vegas, my friend and I were together when she sent him a text saying she’d make him proud. It was a genuine message and she sincerely believed she would win because what she represented was something far greater than herself. She had a genuine interest to break stereotypes and that she did. This is a true inspiration to not only military women around the world. 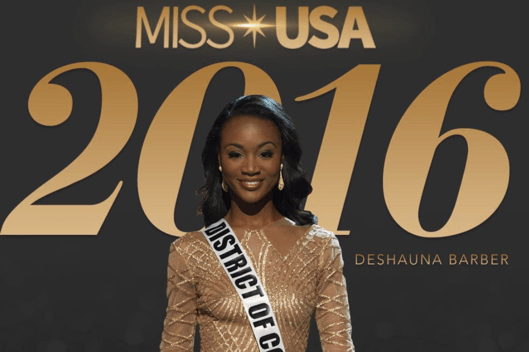 Deshauna Barber has gained respect from many of the pageant spectators who believe these girls are young, naive, weak and stupid. Beauty alone does not define the pageant girl, it is their intelligence, poise, grace, and confidence that make them a true queen. The new Miss USA 2016 has officially broken numerous stereotypes and this will be an iconic moment in pageant history.